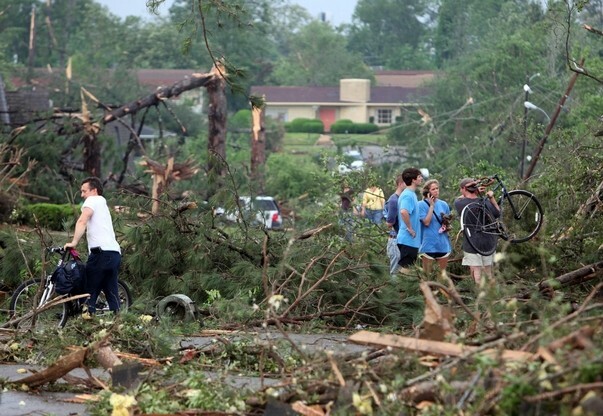 My response to the tornado that went through Tuscaloosa, my wife’s hometown, and where her parents and family live. As you know a tornado went through Adrienne’s hometown last night. I feel as though our house was robbed. I have been there many times and it felt safe and it felt like home. Now it feels violated and destroyed. It is hard for me and uncomfortable. Yet it is so much harder for all those who are living through actual loss. I am angry and frustrated. I want to help but I feel powerless. I want to do something. I know that prayers is something that you hear and respond. So I am trying to pray but it doesn’t feel like enough. Honestly I am so thankful that you spared the Coogans. I think it was an answer to prayer. Yet I am so angry that there is damage to their house and Richards, their car, and damage for so many others. I am frustrated that it will take them so long to get things back to normal. I guess am angry that it will not be comfortable for them for a long time to come. Thanks you Lord that comfort is not the end that we are aiming for. You are about healing, restoration and redemption. Eden is your goal. The ultimate defeat of sin and death is Your aim. Even in the midst of pain, anger, confusion and chaos use Your people to further Your aim, Your goal. God, You are good and I put my trust in You.